The Duke of Cambridge has accused social media firms of being “on the back foot” when dealing with fake news, privacy issues and cyber-bullying. In a speech given at the BBC, Prince William said social networks had allowed “misinformation and conspiracy to pollute the public sphere”. “Their self-image is so grounded in their positive power for good that they seem unable to engage in constructive discussion about the social problems they are creating,” he warned. The prince and the Duchess of Cambridge had been invited to the BBC to try out a new internet safety app. During their visit, the royal couple met children and their parents who had helped design it. “The tools that we use to congratulate each other on milestones and successes can also be used to normalise speech that is filled with bile and hate. The websites we use to stay connected can for some create profound feelings of loneliness and inadequacy,” said the Prince in his speech. The prince said tech firms had a “great deal to learn” on responsibility. “Social media companies have done more to connect the world than has ever been achieved in human history. Surely you can connect with each other about smart ways to deal with the unintended consequences of these connections,” he said. This is far from the first time The Duke and Duchess of Cambridge have spoken out about cyber-bullying. They launched a taskforce to tackle the problem in June 2016, which involved Facebook, Snapchat and Google among others. They have returned to the issue since, but this does represent a change of tone. Rather than focusing on co-operation, this time the prince accused the tech leaders of posturing, being too proud and defensive, and having put their shareholders’ interests above those of their users. Moreover, the prince said he was “disappointed” that the taskforce he had built had failed to achieve more. For Facebook in particular, this couldn’t come at a worse time. The firm has been beset by data breach scandals, claims its products encourage loneliness and depression, and evidence its apps have been used to meddle with elections. And on Wednesday, the New York Times published a fresh series of claims about dubious backroom tactics as the social network tried to fight back against all the negative publicity. Chief executive Mark Zuckerberg is expected to personally defend his company’s practices soon. He has a lot to do to win back the public’s trust. The BBC is a member of an industry-wide taskforce set up by the prince to tackle cyber-bullying. After being greeted by excited crowds outside the BBC studios in central London, the royal couple were pictured with BBC director general Tony Hall and the director of BBC Children’s, Alice Webb. During Thursday’s brief visit, the couple also met young people who wrote and performed a new video for a campaign run by the Prince’s cyber-bullying taskforce. The campaign, called “Stop, Speak, Support”, involves a national code of conduct for children on what to do if they come across bullying online. 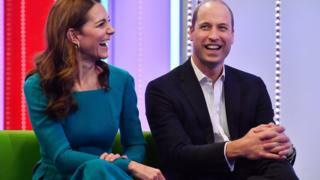 It is not the first time the royal couple have visited the BBC – in 2017 they dropped in on Radio 1 and helped read the UK’s Official Chart with Greg James. And the Queen visited the BBC in 2013, when she was shown around the main newsroom.